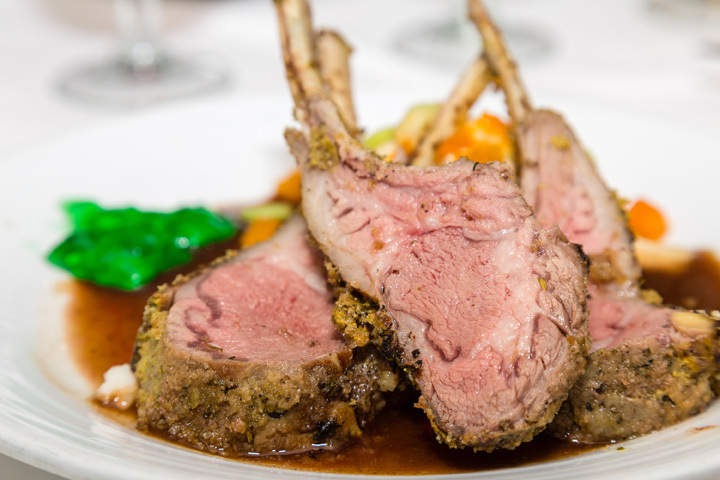 Lamb is a great main dish to serve for a holiday like Easter but it also deserves a spot on the table for a St. Patrick’s Day celebration. “Persillade” is french for a seasoning mixture of parsley chopped together with garlic and butter. This delicious combination make a tasty topping for rack of lamb. Lightly brush the lamb with oil, season with 1 tablespoon salt and 1-1/2 teaspoons black pepper and rub with the chopped rosemary and thyme. Place the lamb in a roasting rack. Roast the lamb for 15 minutes, basting periodically with rendered juices and fat. Scatter the onion, carrot and celery around the lamb and reduce the heat to 325 degrees. Continue roasting until the lamb reaches an internal temperature of 130 degrees. Transfer the lamb to a sheet pan, cover with foil and keep warm. Place the roasting pan on the stove top and cook until the onion, carrots, and celery are browned and the fat is clear. Pour off the fat and deglaze the pan with stock stirring to release the bits of meat that have stuck to the pan; stir until completely released. Simmer 20-30 minutes. Degrease the sauce and adjust seasoning with salt and pepper. Strain through a fine mesh sieve. While the sauce is simmering, mix together the bread crumbs, garlic paste, parsley, butter and 2 teaspoons of salt in a bowl to make an evenly moistened mixture. Spread half on each rack of lamb. Return to the oven until the persillade is lightly browned and the lamb is 140-145 degrees. Rest 10 minutes covered with foil and then cut into chops and serve with the sauce.